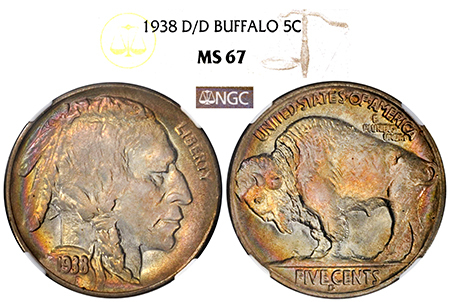 There are very few 1938 D/D Buffalos displaying flawless-to-the-eye surfaces coupled with knockout color as this example! Both the obverse and the reverse are painted in swirls of golden orange, baby-blue, lemon yellow, and hot-pink! This is a gorgeously colored diamond in the rough, folks! While NGC has graded almost 3,000 examples in all grades, only 228 examples have been certified in MS 67. The lustrous perfection of the surfaces combined with gorgeous toning makes this is a winner in eye-appeal and rarity!